Description: Very woody, cut through forest. 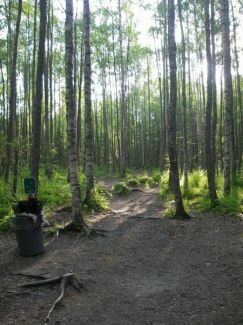 The course is very technical with the surrounding Birch trees requiring players to carefully pick their path too the hole. Tight fairways, with a few that open up. Plays tougher than distance indicates. Local Directions: Driving north on the New Glenn Highway, take the North Birchwood exit. Take a right and follow past the school until you reach the Old Glenn Highway. Next, take a left and continue north until you find the park on the right side of the road just past a bridge. Park in the outside parking lot and then walk straight into the tree line to find tee 1.